Choose between Luma, Red, Green, Blue or Alpha channel to sample from. Control Time-Remapping, Position, Scale, Rotation, Opacity or any selected property of multiple layers. Dynamic controls to adjust and animate remapping values. Relative or Absolute value option. Bake resulting values to keyframes to speed up frame evaluation. 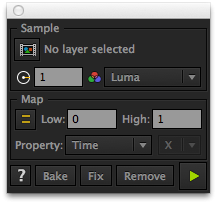 Set the map layer to sample using the "Set Layer" button. Choose which color channel to evaluate. Usually Luma. Set values to remap, e.g., when the Luma channel is selected, and the low and high values are 0 and 4, respectively, the corresponding black and white samples will remap to values of 0 and 4, respectively. Select layers to affect and click "Apply". Adjust or animate remapped values through expression controls added to the map layer. Provides methods to shift, sequence, stagger, or randomize layers properties like in and out points, keyframes, markers and more, presented in a compact UI. Manipulate keyframes and property channels precisely in a compact UI.